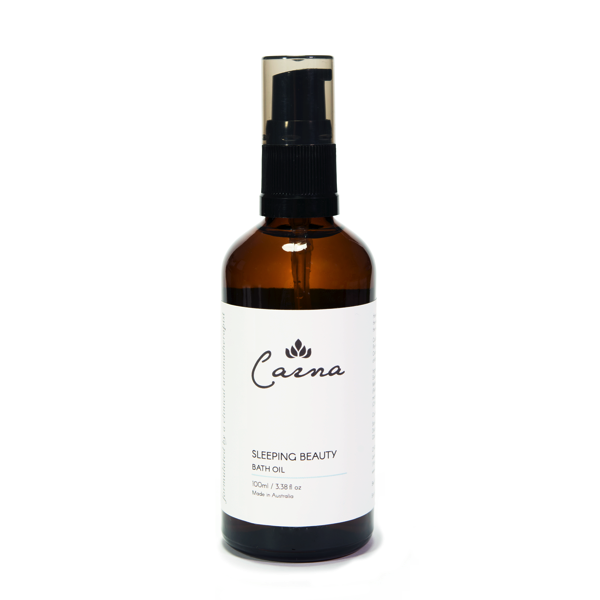 Our 100% natural, hand-blended Sleeping Beauty Bath Oil blend was specially designed to relieve sleeping disorders such as insomnia while pampering your skin. A nightly bath helps to activate your body’s parasympathetic nervous system, encouraging you to relax in readiness for a deep, regenerative sleep. This bath oil’s perfect combination of Tasmanian Lavender, Petitgrain, Orange Sweet and Rosalina with just a touch of Marjoram Sweet and Chamomile Roman enhances these calming, sedative effects as it is absorbed into your skin, olfactory and respiratory systems. Unlike mass-produced commercial bath oils, our hand-made product doesn’t contain mineral oils. It’s entirely natural, so will moisturise and care for your skin — never dry it. Not only for insomnia, our bath oil’s gentle, soothing aroma can be used to create a special self-care ritual experience for deep relaxation, reduced stress, sweet dreams and a feeling of renewal each morning. For average bathtub, add 1 table spoon of oil into the warm water, mix well and enjoy. Gently rub oil floating on the water surface on your skin to moisturise. Caution: Bath oil makes the tub and bathroom floor very slippery. Pay extra caution when you get in to and out from the bath tub. Clean the tub and floor thoroughly after use. Not recommend for children and elderlies without supervising. Prunus amygdalus dulcis (Sweet Almond) Oil, Essential oils of Lavandula angustifolia (Lavender True), Melaleuca ericifolia (Rosalina), Citrus aurantium var. amara (Petitgrain)*, Citrus sinensis (Orange sweet)*, Origanum marjorana (Marjoram Sweet), Chamaemelum nobile (Chamomile Roman)*. Lovely for bath just before bedtime. Highly recommended.